You are here: Home / Christian Talk / Adam, Where Are You? : Why So Many Black Men Have Quit the Church. Adam, Where Are You? : Why So Many Black Men Have Quit the Church. That question has reverberated through the centuries – from Eden to 2018! Black men are not attending church and their absence is reaching epidemic proportions. ‘Church’ here refers to historically Black Protestant institutions made up of mostly mainline denominations (Baptists, Methodists etc.). To be sure, the vanishing black male in worship is not a recent phenomenon. Even as a kid growing up in the womb of the black church in Phoenix, Arizona, I recall seeing legions more women than men on Sunday morning. Surely, though, there were more black men in worship then than what we see today. While the title of this essay presupposes black men have quit the church in disproportionate numbers, statistics bear out the fact that black men do indeed still attend church – just not in the numbers we’d like to see. Research from the American Community Survey and cited by the author and scholar, W. Bradford Wilcox, amply demonstrate that black men attend church at above average rates: 37% of black men aged 18-60 attend frequently (several times a month or more) compared to 30% of non-black men. Thirty-seven percent does not constitute a majority; indeed, there are way too many men of color who do not engage the church at all. So where is ‘Adam’? It’s easier to figure out where he is versus where is not. Most African American men are not poor, out of work, or destined to spend time in prison. Other belief systems appeal to him (in particular Islam). Too much judgment in the church. The church has become a source of more social and personal judgment than personal edification. Too often, men (and others) are met with ugly stare-downs and a less than enthusiastic welcome when they enter houses of worship. What’s the answer? How can we inspire more men to get active in the church? It will first require a radical reinvention of the way we see and do ministry in the black church. While we are in the business of saving souls, we must also ‘save’ the mind and spirit of our brothers, too. Mentoring, bible study and worship must be structured to accommodate the needs of male parishioners – from elementary boys up to adult and senior males. Specific examples should include after-school programs; grief recovery, career-building skills and many others. At our recent men’s conference at the Zion Missionary Baptist Church in Dallas, men gathered to discuss what it means to be godly and giving leadership in the home, church and community. We need men to come out of ‘hiding’ and assume their mantle of leadership in our community. 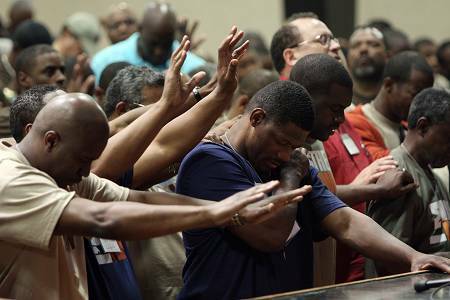 Many black men today en mass are shaking off the spell of Christianity and quitting the church because they no longer want to make the” leap of faith ” to reconcile the unreasonable and believe in an unseen god,or that things that they hope and pray for will eventually come. They are positivists and are willing to get out and work, even on Sundays, to make sure that prosperity comes. According to the King James Version of the Holy Bible “faith is the substance of things hoped for, the evidence of things unseen “. Hoped for, and the unseen are both poor carrots on a stick motivational substitutes for present day food, clothing and shelter. Many black men today are agnostic at best, atheistic at least who are pragmatic and materialistic beings who are living in differing degrees of financial desperation that are tired of waiting on their rewards when they gets to some other-worldly “heaven ” to be with an impotent god.